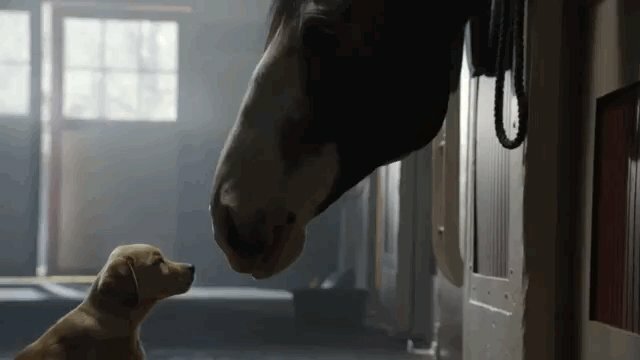 It seems that Budweiser's "Puppy Love" ad is the most popular Super Bowl commercial this year -- and the Super Bowl hasn't even happened yet. The advertisement features an adorable retriever puppy and its best friend, a Clydesdale, making a valiant effort just to be together. It's heartwarming, and it makes absolutely no mention of beer, the product that the commercial is actually about. Still, the ad is undoubtedly effective: it already has millions of views on YouTube, just like the countless viral animal commercials that precede it -- like the Coca-Cola polar bears campaign, or Spuds Mackenzie, period. But why? Well, according to one report, it's because we don't process ads that do have animals the same way we process ones that don't. The study claims that there are two common ways people process information in commercials: one that relies on logical analysis, and one that relies on memory and judgement. The researchers found that when people watched commercials that featured animals, they tended to use the second form of processing -- implying that they were so swayed by the presence of animal actors, they didn't give much thought to whether or not the animals were relevant to the ad. Additionally, the study explains, animals are what give an advertisement meaning. "If most consumers associate positive cultural meanings with specific animal characters, advertisers can exploit those meanings," the researchers write. And, according to another study, "consumers are influenced by both the symbolic meanings that have been culturally assigned to that animal as well as the physical attractiveness and likeability of how the animal is portrayed." That would explain why some animals actually don't work in Super Bowl commercials -- especially when efforts to use them for entertainment cross the boundary between cute and cruel. Chimpanzees, for example, used to be a popular feature of Super Bowl commercials, but when it became clear that many of the young chimp actors -- who, because of their age and small size, were more suitable for acting than adult apes -- concern for the animals' treatment became more important than whatever they were selling. Now, few companies are willing to use live apes in commercials, in part because their advertisers won't even suggest it. Instead, they've started replacing them with other animals -- like bears -- that audiences find equally lovable. But, according to Ace Metrix, a leading advertising research firm, "animals work" in general for Super Bowl commercials. The firm listed animals as one of the top two most popular creative elements in Super Bowl ads, and of their top 10 ranked commercials for 2013, half featured animals. And, according to Ken Wheaton of Ad Age, advertisers are well aware that animals give them a better chance of producing a popular commercial. "If advertising people are being extremely honest, they can never be sure exactly what in their ads drives actual sales," Wheaton said. "But having animals in your ads -- if used appropriately -- definitely drives recall for the ad, if not necessarily for the brand.... And having animals in Super Bowl ads can help you win the ‘Most Popular' contest." And that, Wheaton explained, is the most important part of the game.